Oklahoma City is 3rd in team defense at the All-Star break, and assistant coach Ron Adams gets much of the credit. During my season, I tried to get my team to do a couple things well. We did not adjust to our opponents, scout or change things. We played teams who could not dribble with their eyes up, yet their coach was calling out multiple plays and switching defenses several times. We would beat these teams by 40 points while playing 12 players fairly even minutes. We did not try to win through X’s and O’s, but by being smart and improving each day on basics like passing and catching, lay-ups and containing the dribble. I was amazed that teams would spend 25 minutes in the locker room before games and 10 minutes at half time talking. We never went to the locker room the entire season, and only once did I talk for more than five minutes at half-time. For me, pre-game and half-time was more practice time to work on shooting, passing and lay-ups. 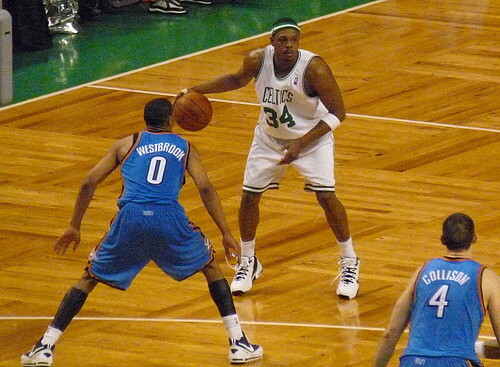 For OKC, Adams runs the defensive portion for head coach Scott Brooks. Sometimes the process of improvement becomes repetitive. For players who want to be players and want to improve, they maintain concentration toward the ultimate goal. For more recreational players who simply want to play, the repetitiveness gets frustrating because they do not value the improvement as much as the fun. On my team, I had a mix of the two. I probably did no more than 12-15 different drills all season. I am not big into variety, and I do not want to waste time explaining the drill’s proper execution. I eliminate most of the typical drills like three-man weaves and zig-zag drills, and nearly every drill is competitive, some form of small-sided scrimmage. This maintains the concentration of the recreational players, as the game is fun, and the more developmental players, as they improve. However, during those times when I felt compelled to concentrate on one specific thing with a block practice drill, the attention of the recreational players quickly waned. I had to switch groups some times to put a more serious player with a less serious player to keep the recreational player’s concentration. On other occasions, I did not switch the groups and allowed the developmental players to work together and work hard and the recreational players to work together and be more social at a basket away from the harder working players so they were not a distraction. In this way, it is a matter of adjusting to the varying interests of your team’s players. However, even at the NBA level, successful teams keep the system simple and focus on fundamentals first to raise their level of performance. Before concentrating on your strategy, make sure the players have the basic tools and fundamentals to make use of the X’s and O’s. This entry was posted in Game Management and tagged fundamentals, Oklahoma City, team defense. Bookmark the permalink. I once heard Gary Gray say that he barely talks at halftime. He takes his players through a “dynamic” warmup, so they are ready to pounce on the opposing team at the beginning of the 3rd quarter.